London and Minsk-based mobile developer Tripledot Studios has raised $8 million in a seed round investment ending today. 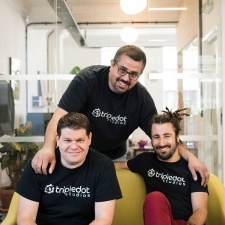 Founded by former members of King, Facebook and Product Madness, Tripledot claims it wants to form the “Apollo program” of mobile gaming by bringing the best and brightest together to make games. So far, Tripledot has released several titles including Solitaire, Solitaire 95, Sudoku and social narrative game Twisted on the App Store, Google Play and Facebook Instant Games. The $8 million seed round was led by Velo Partners. “We are building the ‘Apollo Program’ of mobile games,” said co-founder and CEO Lior Shiff. “Like the Apollo Program brought the best and brightest to achieve amazing things, we are bringing exceptional people together to create extraordinary mobile games. Akin Babayigit, co-founder and COO, previously worked as head of business operations at King Digital, and prior to that spent more than four years at Facebook where he held several key roles. Akin noted: “We’re thrilled to be putting together a truly world-class team in London and Minsk, both of which have emerged as hotbeds of mobile gaming in the past few years. We are very fortunate to partner with Velo Partners, who are just as excited as we are about the opportunities in the mobile games market, and also share our conviction that putting people at the core of everything we do is the only way to create a great company”. Co-founder and chief product officer Eyal Chameides added: “The secret to making great games is actually deceptively simple: bring incredible people together and give them a brilliant, fun and creative environment that enables them to do what they do best.